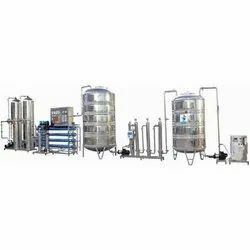 We are a leading Manufacturer of mineral water bottling plant, drinking water bottling plant, bottling machinery, water bottling plant, water bottling machinery and water treatment bottling plant from Rajkot, India. 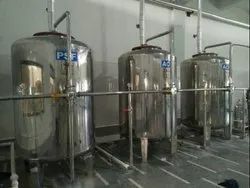 Owing to the expertise of our skilled professionals, we are able to manufacture, export, trade, and supply high quality Mineral Water Bottling Plant. Our provided bottling plant is valued in the market for its performance. This bottling plant is developed using finest material and sophisticated technology. 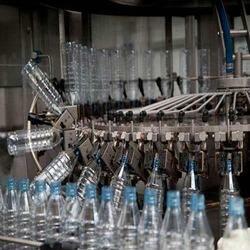 Clients can avail this bottling plant in varied specifications for fulfill their varied need. We are ranked as the well-known organization engaged in offering a broad gamut of Drinking Water Bottling Plant . The offered bottling plant is developed using high grade material and leading technology in compliance with the international quality norms. Additionally, the offered bottling plant is acclaimed for its long functional life. Our customers can easily avail this bottling plant in numerous specifications as per their needs. We are ranked as the well-known organization engaged in offering a broad gamut of Bottling Machinery Plant. The offered bottling plant is developed using high grade material and leading technology in compliance with the international quality norms. Additionally, the offered bottling plant is acclaimed for its long functional life. 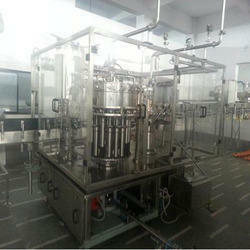 Our customers can easily avail this bottling plant in numerous specifications as per their needs. Drinking Water Plant is Skid Mounted System and can be Installed at anywhere with water Inlet. This system consists of Chlorination Remove Bacteria From Water When Chlorination Dose Done & De- Chlorination Removes Chlorination From Water , Raw water Pump Is Take Water From Water Tank And Give to Sand Filter And Carbon Filter, Pressure Sand Filter Is Removes Turbidity, Activated Carbon Filter Removes Smell & Color, Antiscalant Dosing Worked For The Reverse Osmosis System So With The Help Of That Membranes Not Chock Up., Micron Cartage Filter Is Used For The Remove Heavy Particles Which Comes From The Filters., HP pump Is Provide Pressure To Membranes and R.O. Membranes Is Remove Heavy TDS. Hardness, Alkalinity, Iron, Etc. with Pressure Vessels and sophisticated Instruments with Programmed Control Logic for its full proof Operation. System Include the Electrical and Instrument Control panel PLC Base on Skid. We are ranked as the well-known organization engaged in offering a broad gamut of Water Bottling Machinery Plant. The offered bottling plant is developed using high grade material and leading technology in compliance with the international quality norms. Additionally, the offered bottling plant is acclaimed for its long functional life. Our customers can easily avail this bottling plant in numerous specifications as per their needs. We are manufacturer of Water Treatment Bottling Plants. We are manufacturer of Bottling plant. The machine is Rotary type of design having three turntables for feeding the bottle for Packaged Drinking Water Bottling Plant The bottle is holded at the neck and the body is guided in the Spacers provided. The machine has two stations for Rinsing and three stations for Filling. The filling cycle is controlled through timer device. The water jets are pressurized by Pump for rinsing the bottles from inside. A separate Cap Feeder with storage capacity of 1800 - 2000 caps and Pneumatic/Electric Capper for capping are also provided with the machine. All contact parts are of Stainless Steel 304. The Machine is provided with Mechanical Capper. Drive Motor: 1.5 hp 1440rpm – 440 VAC. Proximity Switches: 24 VDC M18 Size (for No bottle No Fill & No bottle No Rinsing System). Rinsing Pump: 0.5 hp, Single Phase, 1 No. Shrink Tunnel: 6 kW 440 VAC. Cap Feeder: 0.25 hp 440 VAC 32 rpm 3 Phase (1 No.). Shrink Tunnel: 6 kW 440 VAC. 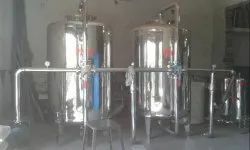 We are ranked as the well-known organization engaged in offering a broad gamut of Automatic Bottling Plant The offered bottling plant is developed using high grade material and leading technology in compliance with the international quality norms. Additionally, the offered bottling plant is acclaimed for its long functional life. Our customers can easily avail this bottling plant in numerous specifications as per their needs. 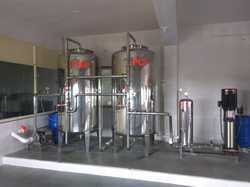 We Provides RO Bottling Plant for making water suitable for human consumption, Pharmaceutical, Steel Etc. Agriculture & other purposes. These plants are used for water purification by eliminating harmful substances From Water So it can be Used without Hesitate. We Are Manufacturing of That Purification Plant Which Removes Parameters Form Water Which Harmful If It Consumes like TDS, Hardness, Silica, and Iron From Water. For The Water purification We Used Sand Filter, Carbon Filter, Reverse Osmosis Membrane Which Give Best result for the purification. Semi Automatic Bottling Plant is Skid Mounted System and can be Installed at anywhere with water Inlet. This system consists of Raw water Pump Is Take Water From Water Tank And Give to Sand Filter And Carbon Filter, Pressure Sand Filter Is Removes Turbidity, Activated Carbon Filter Removes Smell & Color, Antiscalant Dosing Worked For The Reverse Osmosis System So With The Help Of That Membranes Not Chock Up., Micron Cartage Filter Is Used For The Remove Heavy Particles Which Comes From The Filters., HP pump Is Provide Pressure To Membranes and R.O. Membranes Is Remove Heavy TDS. Hardness, Alkalinity, Iron, Etc. with Pressure Vessels and sophisticated Instruments with Programmed Control Logic for its full proof Operation. System Include the Electrical and Instrument Control panel PLC Base on Skid. We Provide Stainless Steel Storage Tanks with Micron Cartage Filtration for Fine Polishing of semi treated water after Mineral Adding. The Mineral rich treated water pass through the Ultra Violet System to the Ozonation Re-Circulation tank. The Tanks are with its Stainless Steel pumps and Level Indicator and Controller. We are ranked as the well-known organization engaged in offering a broad gamut of Revers Osmosis Bottling PlantThe offered bottling plant is developed using high grade material and leading technology in compliance with the international quality norms. Additionally, the offered bottling plant is acclaimed for its long functional life. 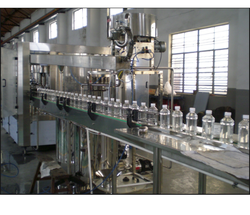 Our customers can easily avail this bottling plant in numerous specifications as per their needs.